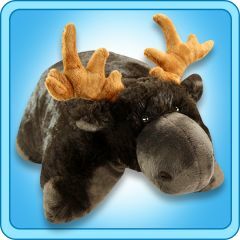 Home > PillowPets 18" > Moose 18"
My Pillow Pet Chocolate Moose Toy - Size: large 18"
One of the funnest, and most popular My Pillow Pets would be the My Pillow Pets Chocolate Moose. 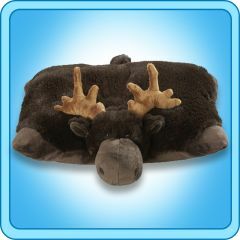 This very cute dark brown moose with adorable antlers is becoming very popular. Moose are big animals that you do not always associate with being the best stuffed animals for kids. However, My Pillow Pets Chocolate Moose has become a hit with the kids for a number of different reasons. The first would be the great dark brown color with awesome antlers sticking out from his head. This very fun toy, or pillow depending on how you are using it at the time, is very popular with children.